The Owl Nebula (Messier 97,M97, NGC 3587) is a planetary nebula located approximately 2,030 light years away in the constellation Ursa Major. It was discovered by French astronomer Pierre Méchain on February 16, 1781. When William Parsons, 3rd Earl of Rosse, observed the nebula in 1848, his hand-drawn illustration resembled an owl's head. 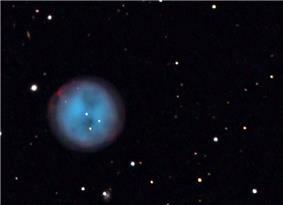 It has been known as the Owl Nebula ever since. The 14th magnitude central star has since reached the turning point of its evolution where it condenses to form a white dwarf. It has 55–60% of the Sun's mass, 41–148 times the brightness of the Sun, and an effective temperature of 123,000 K. The star has been successfully resolved by the Spitzer Space Telescope as a point source that does not show the infrared excess characteristic of a circumstellar disk. ^ Per Guerrero et al. (2003), the age is 12,900 × d years, where d is the distance in kpc. According to Stanghellini et al. (2008), d is 0.621 kpc. Hence, the age is 12,900 × 0.621 ≈ 8,000 years. Norton, Andy; Crowther, Paul; Hardy, Liam. "M97 – Owl Nebula". Deep Space Videos.